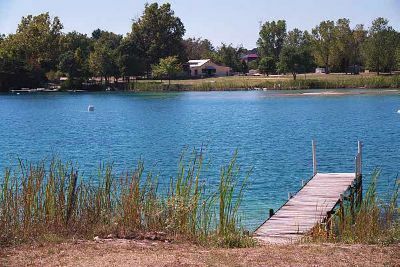 Lake Athens is located about eight miles east of the city of Athens in Henderson County, Texas, on Flat Creek, a tributary of the Neches River. The Athens Municipal Water Authority owns Lake Athens and Lake Athens Dam for the dual purpose of water supply and recreation. It is the city's primary water source. The lake's Water Rights Permit is No. 1915 and dated September 26, 1958. Construction for Lake Athens and the dam started September 25, 1961 with deliberate impoundment beginning November 1, 1962. The project was officially completed in May 1963. The design engineer for the facility was Wisenbaker, Fix, and Associates. The general contractor was Elm Fork Construction Co.
Catching up a drainage area of approximately 21.6 square miles, Lake Athens Dam and structures consist of an earthfill embankment, 3,000 feet in length, with a maximum height of 67 feet and a crest elevation of 453.0 feet. The service spillway is an uncontrolled rectangular drop inlet. The crest elevation for the six-feet by six-feet opening is 440.0 feet. The emergency spillway, located at the north abutment of the dam, is an earth trench cut cut through the natural ground. The crest is 300 feet in length at elevation 446.0 feet. The outlet works is an 18-inch diameter concrete pipe with an invert elevation of 396.5 feet above the mean sea level and is controlled by a slide valve. According to the Texas Water Development Board 1998 survey, the lake's capacity at the conservation pool elevation of 440.0 feet was 29,475 acre-feet and the area was 1,799 acres. The dam controls a drainage area of approximately 21.6 square miles.